Gifts for Coworker, Initial Pendant. Custom Jewelry Gifts for Her. 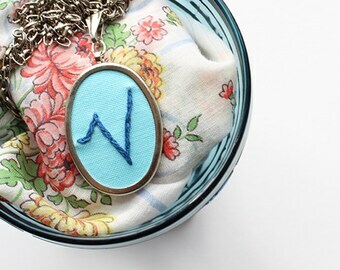 Embroidered Initial Necklace. Monogrammed Gifts Under 50. Small Gifts. 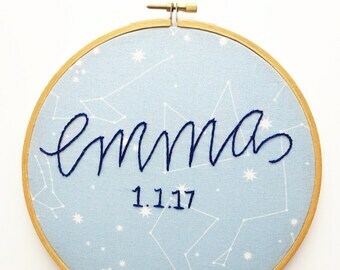 Announcement Custom hand embroidery with an emphasis on stitched text and letterforms. Personalized necklaces and initial jewelry handmade in the USA. Please note current turn around times are marked in each listing. I work hard to make my designs unique. My copy, photos, designs and products are all copyrighted and are my personal property. Please do not use images without consent and please keep originality in mind when creating your own products. be original or be gone. The Wishbone stitch collection is protected under copyright. Custom hand embroidery with an emphasis on stitched text and letterforms. 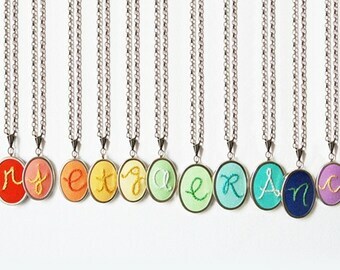 Personalized necklaces and initial jewelry handmade in the USA. Teacher Gift Small. End of School Gift. Letter Jewelry. Alphabet Necklace. Personalized Jewelry. Initial Jewelry. Hand Embroidery. Nerd Gifts. Obsessed Mind. 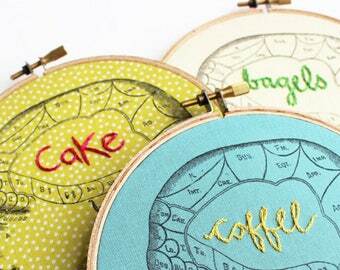 Embroidered Hoop Art. Gifts Personalized Phrenology. Custom Embroidery. Hand Embroidered Word Art. Custom Jewelry Personalized Cotton Anniversary Gift. Two Year Anniversary. 2nd Wedding anniversary Gift. Initial Necklace. hand Embroidery Necklace Custom Gifts. Letter Pendant. Personalized Jewelry. Monogram Pendant. 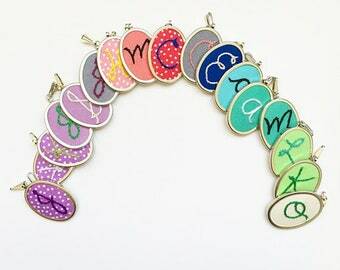 Colorful Initial Necklace. Made to Order. Letter Pendant. Personalized Jewelry. 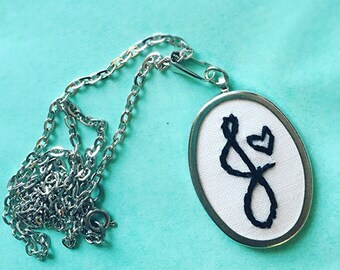 Monogram Pendant. 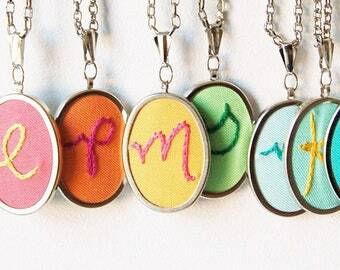 Colorful Initial Necklace. hand Embroidery Necklace Custom Gifts. Made to Order. Initial Pendant Best Friend Gift Coworker Teacher Gift. Personalized Jewelry. Initial necklace. 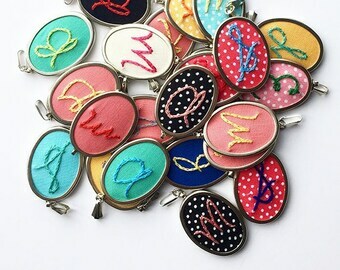 Hand Embroidered Monogram Name Necklace. Flower Girl Gift. Personalized Jewelry for Girls. Modern Initial Necklace. Embroidery Necklace. Letter Pendant. Teen Girl, Bridesmaid Gift. Custom Jewelry. Initial Charm. Summer Accessory Women. Hand Stitched Letter. Handwriting Jewelry. Personalized Necklace. Made to order. Bridesmaid Gift Idea Woman Birthday Gift. Best Friend Gift. Initial Necklace. Non Traditional Jewelry Personalize. Modern Embroidery. Flower Girl Gift Initial Necklace. 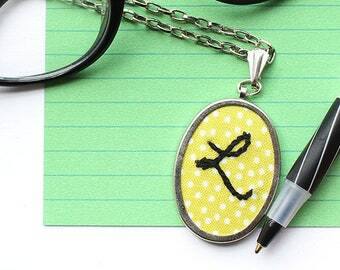 Personalized initial, Embroidered Letter Pendant. bridesmaid, Girlfriend Gift. Mothers Initial Necklace. 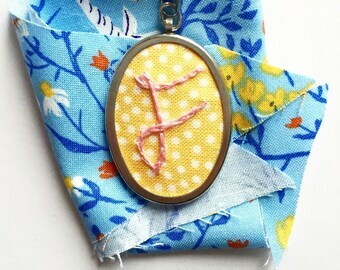 hand embroidered initial pendant. initial jewelry. personalized gift. 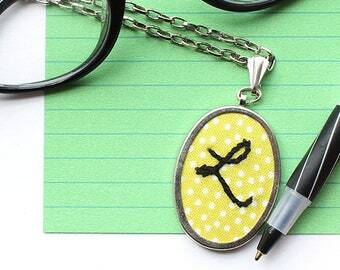 hand embroidery letter necklace. Lovely initial necklace. Bright colors and well made. Beautiful initial necklace that arrived exactly as ordered. I loved the pretty little wrapping too. Initial Necklace. Embroidered Pendant. Stitched Letter. 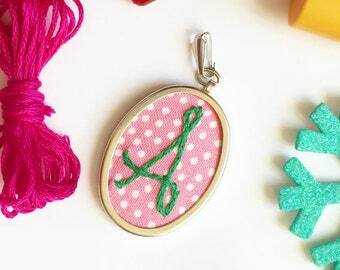 Embroidery Charm with Colored Initial. Stitched Monogram. Personalized Gifts. 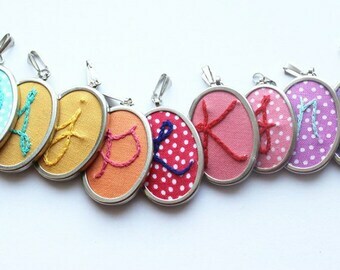 Custom initial necklaces are made to order in color of your choice! The perfect gift! All necklaces are 20% off right now in my shop! Come over and grab a few for gifts that everyone will love! Monogrammed Gifts. Initial Necklace. Letter Jewelry Personalized Gifts for Her. Mom Jewelry Custom Embroidery. 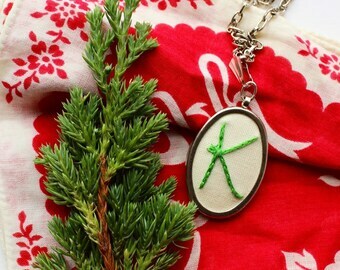 Embroidered Pendant Necklace. What's on your mind? Donuts? Books? Work? Coffee? 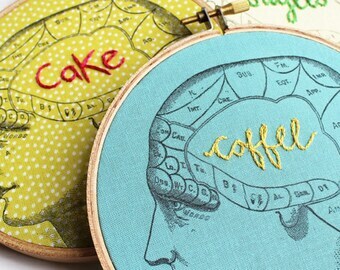 Whatever it is you can have a custom phrenology made for it! The Merriweather Council was begun in May of 2010 promptly after my college graduation. I was supposed to go to graduate school, but a lot of reallllly weird things happened and I ended up not going. That's was I was supposed to do, but Merriweather Council is what happened instead, and I believe it was meant to be and also, this is way better than I imagine graduate school ever would've been. Four years later, here we are! Year 5 is going to be a lot different though, stay tuned. owner, founder, maker, lover of boy bands. Mom, advisor, chain maker extraordinaire, therapist, travel buddy. The website and its content is owned by The Merriweather Council LLC (“Company”, “we”, or “us”). 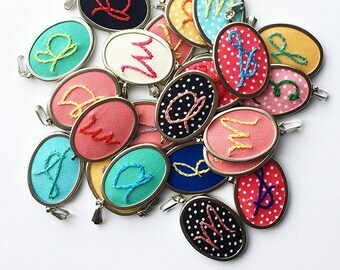 The term “you” refers to the user or viewer of merriweathercouncil.etsy.com (“Website”). Unless an error is made on my part, returns, refunds and exchanges are not accepted or offered due to the custom and personalized nature of these pieces. Please email me danielle@merriweathercouncil.com for a line sheet and more information on wholesaling with me. Oval Necklace Pendant is 2" long from very top of the loop to very bottom of the pendant - and approx. 1" wide. Necklace components are NOT sterling silver. If your DOMESTIC order goes MIA without update to tracking info for 18 days, I can offer a refund or replacement. International orders without upgraded tracking cannot be offered the same. Contact me for tracking options to international locations before purchasing.